A finished burger has to have matching top and bottom buns, at least one meat patty, and may have lettuce on top of the patty. (Pickles and ketchup are not available. So sorry!) Once you have the ingredients ready just click and drag them into the right order! The best part about Burger Buddy is trading ingredients. Need a top bun? Trade for one! It's really easy. Click on the item you want to trade away, then click on the item you want in return. The other player will see a Yes/No balloon pop up right under the piece you're offering. If they hit "Yes" then the pieces will switch places! If anyone sends you a trade, you'll see a Yes/No balloon pop up under the piece that they're offering. You don't have to trade anything if you don't want to, but trading is a great way to earn lots of points and make new friends! In addition to mouth-watering ingredients, you'll also find free spins and bonus points on each spin!! You can get anywhere from 3 to 25 free spins at a time! Whoa! In Burger Buddy points are based on the ingredients in your completed burger. It might look complicated, but it's pretty simple! Each ingredient is listed in the table below. Don't forget, Club Winster members get four times the points! 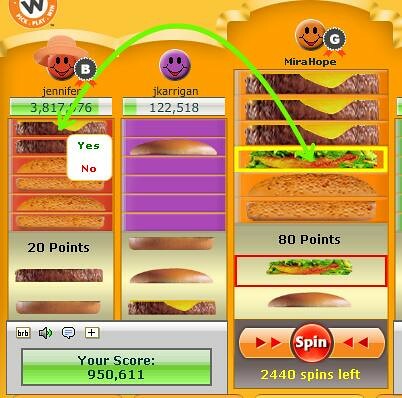 As you may have guessed by the name, stack bonuses are extra points that are added to your completed burger. 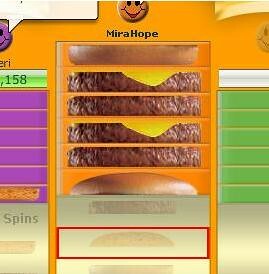 You can only get one stack bonus per burger, so use trades to make the best burgers in town! What is the BEST burger? It's a 4x cheeseburger on a sesame bun! It's hard to get all of these great ingredients by yourself, so work with your teammates and help each other out! In Burger Buddy, any burgers you make are submitted automatically. No "Cash In" button needed! This makes things a bit simpler, but it also means that you need to be VERY careful with your buns. "Accidental" burgers are common and they're not fun when you're trying to build a big stack! Here are two different ways to keep your buns safe and (temporarily) patty-free. These sesame buns are ready to go! By keeping both halves close together you can't accidentally spin a patty between the buns. Once you have all of the patties you want, just switch the top bun with the top patty! Another method is the upside-down burger. When you're ready all you have to do is switch the top and bottom buns. You can avoid most accidental burgers if you just plan ahead a little bit and get your buns in place! Large burgers are lots of fun to make, but you can waste oodles of spins just trying to turn an extra bun into a patty. If you have an extra set of buns, make a small burger to free up space. 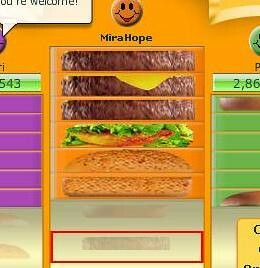 Even the basic burger is worth 60 points! Lettuce and plain patties are both worth 15 points, so you'd think that adding lettuce to a burger is the same as adding another patty. It certainly sounds logical! But many people forget about the stack bonus for having 3 or 4 patties. Once you add the bonus in it becomes a different story. Let's compare burgers with lettuce to burgers of the same size that have just patties. No difference here! Since a 2x patty doesn't get a stack bonus, it's worth exactly the same amount as a 1x patty with lettuce. How about we add another patty to the party! Whoa! You can see that stack bonus kick in! The 3x stack bonus adds 25 points! (CW 100) Now the biggest burger you can make with lettuce is a triple(3x) patty. How does it compare to a burger with 4x patties? Lettuce isn't worthless, but it's best for just single patty burgers. Otherwise trade it or spin it and hope for a patty! 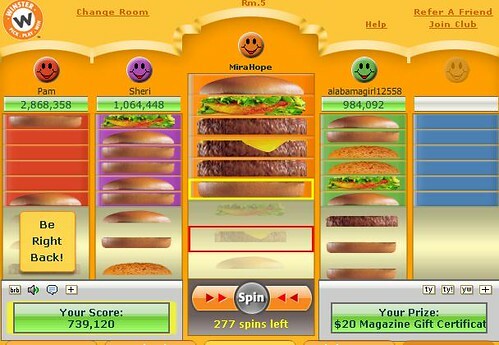 As with all Winster games, Burger Buddy is best played as a team!! If you have an extra set of buns that you can't use, look to see who might need them. Extra lettuce? Trade it! Even half of a bun can be a huge help to someone who has a ton of top pieces but no matching bottom. In general, when you help others they will return the favor. Unfortunately, sometimes you may find a "leech." This is a person who accepts all of the trades but never shares their extra sesame buns or patties. It can be frustrating, but don't let it ruin your day! Just don't trade with that player anymore and move on! That's everything! Tie your apron on and start making some burgers in Burger Buddy!